There is SO MUCH on sale at the eStore that the best way to shop is to go there & look. Definitely get your 50% off Deluxe (Promo Code: BFDM18) while you can!!! 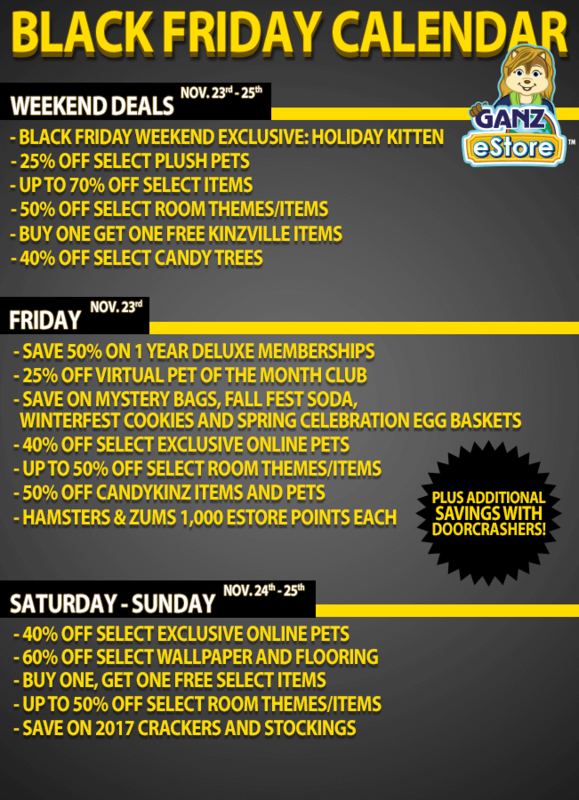 Hopefully they will have points for 50% off on Cyber Monday – please please please Ganz!?!? Hourly DOORCRASHERS end at Midnight Friday. 40% off FRIDAY includes tons of mini theme items & great items like Blue Ribbon/Barnyard, Cheerful Burrow, etc. LOL, Other side = Webkinz Insider. I am dual posting. And since some of them are not here, I figured I would see if others had some helpful hints I could pass along. Well, that’s refreshing! Thank you and forgive my naivety. It was meant out of respect for Your space. 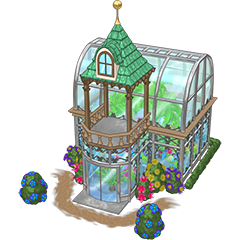 I bought 2 of those Greenhouses, they are so pretty! Just a head’s up, because I do Asian account rare preview, I noticed that the Holiday Kitten’s banner said something that leads me to believe that there will be a release of another ‘friend’ type of pet. HOLY TOLEDO, Arte’s at it really early tomorrow! 8 am rare! Thanks for all of the birthday wishes… really meant a great deal to me !! moms.. hope you are right about discount on points for Cyber Monday…Would really like to take advantage of a sale…. Turkey turned out really good yesterday… Day was quiet but nice..
Will be celebrating birthday on Sunday at family gathering.. My sister’s b day is the day before mine so we celebrate together ! Hope you had a great Thanksgiving with family and friends.. I just got Deluxe in August. Can I possibly buy a continuation of my Deluxe account on this sale? Do you know if it’ll just start up after the one I have expires next August, or do I just have to let mine expire, and wait for Black Friday next year? That greenhouse is gorgeous- I’m bummed I missed it! Puma, I usually buy 4 deluxe memberships on Black Friday. I buy them as gift codes and print them out for when I need them. Sometimes they have deals like this other times of the year, but I don’t like to chance it. The door crasher last hours was a Pup Fridge and this hour it is a winter dress. Happy Birthday Gaga, I hope you have a wonderful time with your family on Sunday and I am very happy to hear your turkey was a success. Dixiecup, you are too funny. I saw your comment on the wkn about Dr. Quack and what he used to say to pets at the clinic. I really miss those funny comments. Sending my gratitude and thankfulness to everyone on this blog. Peace, love and joy to set the world free. oooooohhhhh Dixiecup – a surprise for tomorrow would be FUN!!! and we need to look for something at 8 am tomorrow? am i confused? I might get the 50% off deluxe. I think i pay around $6 a month for it and the only ‘extras’ i get are 1000 estore points a month. The 12 month membership is looking like a much better deal and I’d get more of the extra stuff. Can I cancel my membership midmonth? I think mine renews the first week of december. I cancelled the automatic renewal for my old deluxe membership and bought the one year membership, but nothing is showing up for it. It came with a flutter cow and I don’t know how to get that on my account. Do I have to wait until my old membership runs out (on the 5th i think)? You can cancel it so it won’t auto renew next month, Chococat but you can’t stop what you already paid for. You would need to buy a gift code and put it on when the deluxe expires. Oops was typing when you posted. You use the code in the adoption center and yes you have to wait to add the year of deluxe when the monthly ends. The flutter cow code would of been on the on screen receipt when you bought it. They should send the code in an email and it would be in your orders. When the estore is particularly busy sometimes there is a delay with the emails or order listing. I didn’t get the gift code thing, I had it added directly to my account. I can’t find the code for the cow anywhere. i wish i could pay cash somehow for the estore stuff. dh and dd went out this morning and out out again now……….she was so happy to go to a dollar tree!!!! needless to say big money boston does not have them. anyways, my trek was for gift cards on sale……….yes gift cards…..at kroger….spend so much get 15 percent off, or spend so much and get a twenty dollar coupon off groceries………..so I guess a very dee centric type black friday……. and we have to pick a dental plan!!!!!!!!!!!!!! dh has been putting it off forever. he has to do it as he is the sponsor……………I have narrowed it down to two places that service us and boston………one is fourty dollars a month cheaper and is our regular dentist! DUH! gonna have to get out my big shoes when dd goes home to make him sit and do it…………so weird to have a choice! Chococat check the auto renewal place the code might be there. We tried to go to the movies, wasn’t expecting it to be busy. Was very wrong about that, sold out, so spent a couple of hours wandering around a craft/antiques store instead. May try again tomorrow with prepurchased tickets. Picking out medical and dental plans can be a pain. I think the only one we haven’t had to figure something out at some point or another is eye care. When there hasn’t been a dental choice dh doesn’t remember the name of what we have, when I ask, so stuck telling the office the one the company he work for is using this year. I did my Black Friday shopping online. Sort of miss going out in the wee hours hunting down deals but there wasn’t any point. Still can’t find the code anywhere. May contact ganz. Need to think of a name for when the code finally decides to pop up. Wasn’t expecting to get a pet with the membership, so I don’t have anything picked out. Leaning towards strawberry moomoo (to go along with my brown cow, chocolate moomoo) but I feel like it should also be related to how it has wings. Not sure. I’ll probably go with strawberry moomoo anyways. I’ve looked through every category on my estore account. Nothing. Not in the email they sent me either. Maybe the cow ate it. Choco- The code for the cow will not show up in your order history until the new deluxe membership starts. My accounts expire in December and I always have to wait for the codes. Once your new membership starts go look under active membership orders. P.S. I never buy the membership code because I want all my estore points to go my estore account. Amy – hey will you clarify your PS? i might need to understand this better … I thought you couldn’t buy the membership directly for your account unless it was close to expiration? Also got the Midnight Marten. Had to pare back my shopping a little, as husband and I shopped a LOT for Kiddo Christmas today, but I’d not seen the Marten before! Otter pup is always there- I’ll have to wait on him! Moms – You can buy the deluxe membership directly for your account as long as your deluxe account is set to expire within 30 days of purchase. Unfortunately for me, since Thanksgiving fell early this year, my accounts will not expire within the next 30 days. 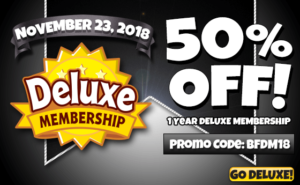 I will be making my deluxe membership purchases on January 1st when they have the next 50% off memberships. Thank you amy. I thought that would be the case, but I wasn’t completely sure. I fully intend to live off of potatoes and cherry pie until these leftovers are gone. There are 4 medallions per day, so even if you get all 4 you should ‘effectively’ get 120 IF you are on every day. Now, I don’t think that they are just dropping Retriever medallions, I think there are regular medallions also being dropped because you can make up to 10 medallions a day. NOW, here’s the kicker. Many people will be right at the cusp of winning that pet .. so close that they will be tempted to sacrifice any and all of their acquired medallions to anypet coins. Oh Fiddle, I forgot to mention that they have extended their 50% off annual to include today. It seems many people have been having issues getting their memberships. I don’t know if that means the ‘princes and princesses’ of IT will be available to help people walk through the labyrinth, but at least it is something. I think since they are giving us 25 snowy retriever medallions in our Christmas gift, they are trying to make this achievable but not just a “given” for all of our side accounts and such – plus they want to increase our time in WW because that benefits them. I’m really excited to get this pet – so cute & great psi!